Hoodlums attack churches in Kaduna, injure 2 - BlogIT with OLIVIA!!! 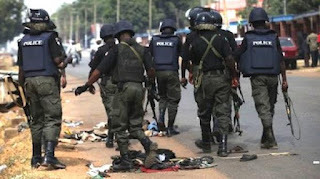 HOODLUMS, number­ing about 50, at the week­end attacked three churches around Ngwan Baro, Chi­kun Local Government Area of Kaduna State, leav­ing two persons critically wounded. Eyewitness account stat­ed that at 5 p. m. penultimate Friday when some worship­ers were praying in their re­spective local churches, the hoodlums struck. When contacted, Police Public Relations Officer in the state, DSP Zubairu Abubakar, who confirmed the incident, said one Akim Samuel of ECWA Church had been arrested in connec­tion with the attacks. Abubakar said prelimi­nary investigation revealed that the perpetrators were Christian youths. He also confirmed the death of 20-year-old Thank-God Peter, who went to Ferroro River with his friend to swim and got drowned in the process shortly before the attack. He said Peter’s corpse had been taken to the mortuary while investigation continued. Efforts, he said, had been intensified to arrest fleeing suspects. Narrating her ordeal yesterday, Founder, Redemption Hill Church, Prophet Julianah Adebayo, said the miscreants were pursuing people from a nearby prayer mountain with deadly weapons, brutalising anyone at sight and in the process, they broke into her church where about N250, 000 cash, phones and other valuables were carted away. Another victim of the attack, who is the Founder of Holy Michael Church, Ngwan Baro, Kaduna, Prophet Yusuf Joseph, described the experience as “worrisome.” “At about 5:30 p.m., I was praying on the mountain when I saw some boys coming with wood and all that. They sighted me on the mountain and started shouting ‘kill him kill him, he’s one of the prophets we want to kill’. They beat me and I kept running. I sustained wounds all over my body. “When I eventually managed to escape, with little energy in me, I went straight to the police station and narrated my ordeal. Some policemen came with me almost immediately and pursued the hoodlums. They caught one of them,” he said.